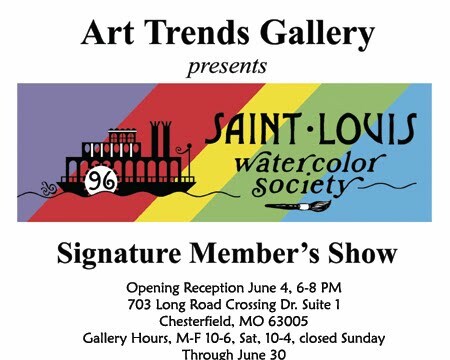 While our current juried show, 11th Annual Juried Exhibition by the Saint Louis Watercolor Society, is on display at Creative Art Gallery, we are now preparing for our next major exhibit. Signature members will be showing their work at a new venue, Art Trends Gallery in Chesterfield. (click for a link to their website) Receiving is June 1, 2-7 PM, $7 per painting. The opening reception is Friday, June 4, 6-8 PM, refreshments provided by Art Trends and SLWS. For this exhibit, you must be a signature member of SLWS. Previous award winning paintings are allowed; let’s show them our best! Retrieval will be July 1, 10 AM-6 PM. If you have not already done so, please email Mary Mosblech at mosblechart@sbcglobal.net to sign up for this show. Here is an e-invite (right-click the image, copy and save) that you can send out to your friends, family and clients. Hard copy postcards are also on site now at Art Trends if you would prefer to send postcards by mail.